Please select up to two slides and where you would like them placed. Questions about Dimensions? 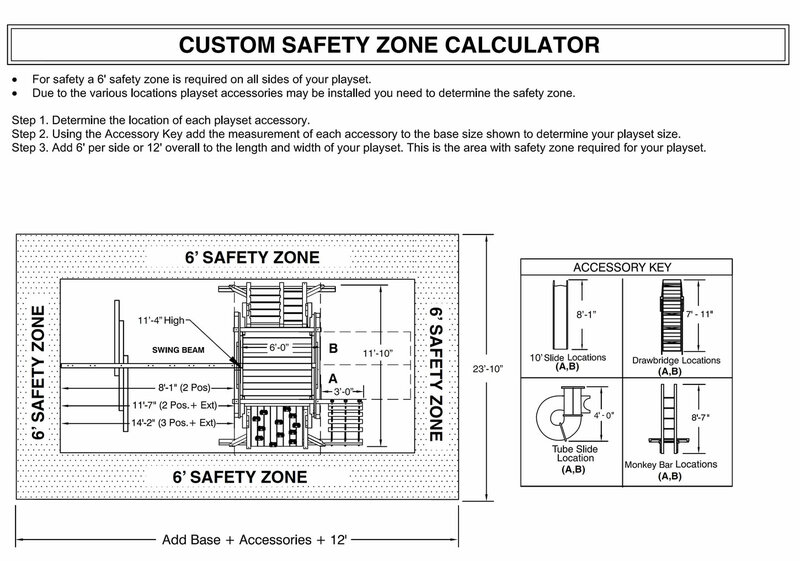 Check out our Safety Zone Calculator. We included a rockwall with rope ladder on this design to create the ultimate climbing adventure, but the rest of the design is totally up to you. After all, you know your kids best. Thanks to our new custom swing set designer, you have the ability to design a beautiful swing set that will be the perfect fit for your family and backyard. Don't worry, the user-friendly design will let you know what option fills in each slot. Let your inspirations come to life and have fun designing a swing set that you cannot find anywhere else. After you're satisfied with the design, you can simply add it to your cart or order by phone. If you get distracted and want to resume your design later, you can save it too. Why not share your design skills with your friends and family? Play deck: 25 sq. ft.
We also offer professional installation on this swing set for $299. We have had the Pot O Gold Designer set for 3 years and it has been a great addition to our yard. Not only do the children (3) enjoy it but it is beautiful to look a as well. Thank you for a great product and great customer support. We purchased a swing set 13 years ago and it is still in great shape. We recommended Kids Creations to our church as they were looking for one as a memorial gift. They loved it and the price was great. It arrived just in time for our Vacation Bible School so needless to say it was a hit. The kids loved it and it handled all the children with ease. In regards to the swings themselves, they are awesome. That is my favorite part because I can swing with my kids and it is comfortable. Our kids (4 and 6 year old girls) just love the playset. We looked at several different vendors but decided on this company given the combination of price, flexibility and design. After one year, the playset looks brand new and the installer was fantastic. I would recommend it to anyone. We recently purchased a custom/build-your-own Pot-O-Gold redwood swing set from Kids Creations and could not be happier! The customer service at the company was top-notch. They were very responsive during the ordering process and afterwards. The installers showed up on time and did a phenomenal job on the installation. Being a perfectionist myself, they installed/spaced every board exactly how I would have. Since the installation, the whole neighborhood has been over to play on this thing. We've had adults in the tower, and on the swings and the wood didn't even budge. I'm very confident that it will support my 11 year-old daughter and her friends. Most of all, this redwood swing set is gorgeous. It really enhances our yard and will likely add value to our property. It doesn't look out of place and blends in well with our yard and landscaping. Also, much better than some of the other competitors swing sets that we looked at in-person (Cedar Works, Rainbow, etc.) These seem much more sturdy and safe than the others. Very happy with our purchase. Highly recommend! I would greatly recommend your products for anyone looking to get exceptional quality at a very reasonable, low price. My wife and I would like to convey how happy we are with the Three Ring Adventure Swing Set. This is just what we wanted. The step by step instructions made it easy to put together and the pre-drilled holes aligned perfectly. It took about 5 hours to assemble and in no time our two girls felt right at home. The affordable price and beautiful red wood made it easy to purchase. We were also impressed with the customer service as well as the easy going delivery man. He backed his truck exactly where we wanted and even helped unload the swing set. The swing set and play station looks great in our backyard and best of all my daughters love it! They are always outside climbing and swinging. I would recommend Kids Creations to anyone. Thanks again! My daughters just love the system. I found Kids Creations very easy to deal with the individual that installed the system did an excellent job. We like the overall look and feel of the redwood play-set we got installed in July; we find the design quite enjoyable for children to play and construction solid. The price seems better than comparable models from other brands. We were disappointed though with several defects in some parts of the wood frame. Very deep cracks ran along the entire length (well beyond those expected from "natural" cracks) in several short brackets (e.g. those connecting the deck w/ the rock wall and ladder), some of which appeared fresh. All but one of them had been replaced by 3 technicians who had to make 3 separate visits over 2 months after the installation. There seemed to be a lack of communication as not all the correct pieces were brought leading to more visits than necessary. Top plate of railing on the deck had screws sunk too deep causing surrounding areas to chip. At any rate, we do appreciate the efforts to come and try to fix them. However, we are still waiting over 3 months to receive an ordered item to come! These are issues/defect that could have been avoided and easily repaired. We currently have six children, ages 13 to 3. It is so much fun to watch them all play together on one jungle gym! The varied pieces allow for creative, make-believe play that includes everyone and accommodates all skill levels. 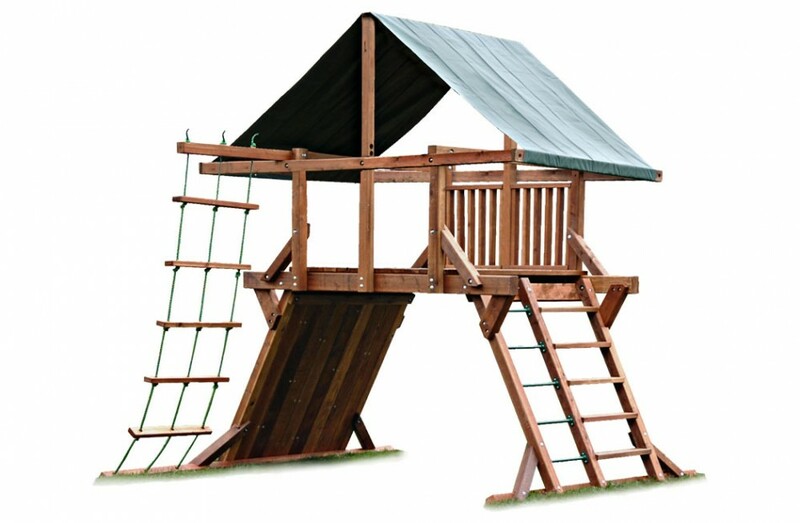 It is also comforting to know that this is a set that will last for many years and is sturdy enough for the adults to join in as well. The assembly team was friendly, quick and followed through on their promise to return with a missing part. They also provided a quality "temporary" part to allow our children to play on the set immediately. I would definitely purchase from this company again! The kids are having a ball and always look forward to their trips to our house. We really appreciate the extra time spent with us to get the ladder fixed. I know if took exrtra time and labor. The crews that came to our house we extrememly courtious and helpfull. Thank you so much. love it! great quality, expert installation and great customer service! I researched options extensively and found a local Kids Creations site to see the sets in person. The quality of the wood, swings, bolts, beams and everything was so much better than anything else we saw. Our kids are 10 and 8 and we wanted a larger frame set that also would hold up well for them. This set met all of our requirements, and exceeded our expectations! The delivery and install was flawless. The installer was prompt, professional, and very detailed oriented. We love the set and are so happy with the decision.